Both throughout my playing career and after, I have been privileged to have been invited to participate in numerous golf events at some of the most luxurious locations all around the world. Hosting your own event, in your own name, for the charity of which you are President can be a daunting task. Certain criteria have to be met by the host venue both for the celebrity guests and the amateurs. 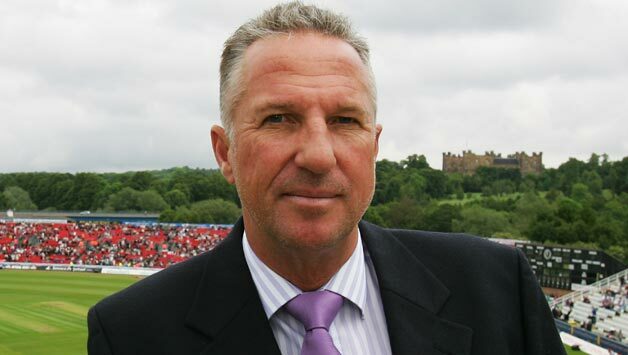 That is why my decision to host the Ian Botham Charity Golf Classic in aid of Leukaemia Research at Desert Springs in October 2008 was an easy one and due to its phenomenal success, why I have selected Desert Springs to host the final of my next Charity Golf Series. I stayed at a friends house about a 2 minute walk from the clubhouse. I had a great time. The course is challenging but excellent and the food in the clubhouse was great. The staff are friendly and there is a deck menu for the day and a restaurant menu for the evening. Could not fault any of the food, there was plenty of choice and it was all very good. I hope to be back! I stayed at a friends house about a 2 minute walk from the clubhouse. The staff are friendly and there is a deck menu for the day and a reataurant menu for the evening. 4 of us stayed here last week in one of the villas – 10 Desert Gold. The villa itself was lovely and I think we were the only people staying in that area of the resort so we had the communal pool to ourselves. All the team members are really friendly and will happily go out of their way to help you. Breakfast is superb and there's lots to choose from. The quality of the food produced in the restaurant in the evening was also 1st class. The golfcourse is in superb condition and is a real challenge. There's lots of very picturesque towns a short drive away so plenty of things to do for the non golfers. 26 golfers went to this fine golf course, the staff were excellent the course superb. only set back bar staff not enough and very slow. Breakfast is superb and there’s lots to choose from. There’s lots of very picturesque towns a short drive away so plenty of things to do for the non golfers. Just a quick email to say thank you for your making our stay very, very enjoyable. The delightful lady on reception, I think her name is Gulia, for ensuring that the bright red shirt was duly sold with an effervescent, fun attitude. Very efficient and a credit to your organization. The food was excellent, well presented and very tasty. The restaurant staff were patience personified, bearing in mind some of our dreadful time keeping. The accommodation was as one would expect from a quality resort, and as this was my third visit, (The first 15 years ago, when the club house was the white marquee next to the putting green) the 4 days just flew by. I will happily return in due course, and if I can persuade my wife, bring her with me. The golf would be academic in that instance. 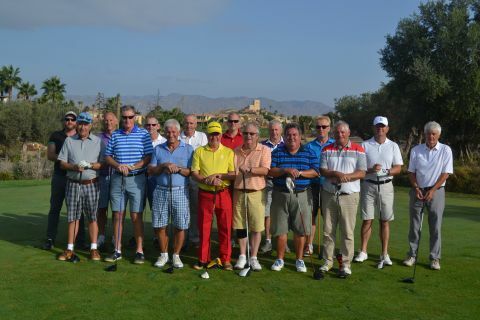 Desert Springs Resort was host to the ‘2016 Brokenhurst Manor Golf Club Captain’s Overseas Golf Break’ between 03rd – 7th October. Brokenhurst Manor Club Captain Jimmy Campbell and Club Secretary Neil Hallam-Jones accompanied 14 members to enjoy 5 days of winter sun, utilising the excellent practice facilities at the Golf Academy and playing each day on the Championship Indiana course. The players were accommodated in some of the privately owned apartments normally reserved for holidays and short breaks at Desert Springs and the resort’s executive chef was on hand to cater for the requirements of the players dining each evening in the ‘El Torrente’ Restaurant as well as a private dining experience within the resorts infamous ‘Cave Bar’ restaurant. “Many thanks for looking after our group so well, we all had a fantastic week. A wonderful course, and the settings is magnificent. You can see what it would be like to own a property here! Slow round but the food buggy kept us fed and watered. A wonderful experience. Had a look at sales area, very interested in a future investment. The success of Desert Springs can, quite simply, be put down to the standard of service maintained throughout… it is the epitome of service. It has customer service honed to a fine art. It is service of the highest calibre carried out by staff who give the distinct impression that they enjoy what they are doing. 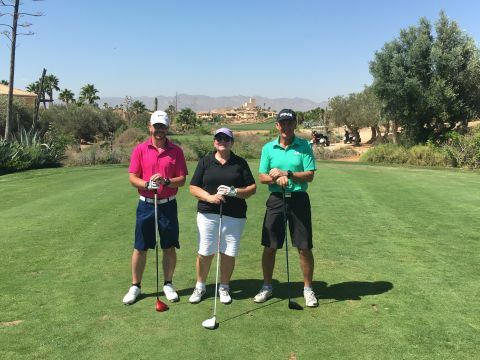 Desert Springs Resort was host to the ‘2016 Brokenhurst Manor Golf Club Captain’s Overseas Golf Break' between 03rd – 7th October. "Many thanks for looking after our group so well, we all had a fantastic week. A wonderful course, and the settings is magnificent. You can see what it would be like to own a property here! Slow round but the food buggy kept us fed and watered. Had 4 nights at this golf resort and was very pleasantly surprised. We upgraded from the town house to the villa which was on Powderhorn overlooking the 16th tee. The villa was spacious and clean with a great outside area and ample 6×3 pool. Bedrooms where good sleeping 8 easily. Golf was cheap with our discount at €50.00 and a buggy €30.00. Golf club hire was €50.00 and clubs where Taylor Made M2 so good quality. Range was good €2.00 for 35 balls. Restaurant was good value and can recommend the lamb. "Great place to stay for golf"
We spent a week here in September and had a wonderful time, the golf was superb as were the guys that sort out your clubs, buggys etc. The lady at the golf reception was so helpful as we had problems with Goldcar rentals and a broken car window (don’t rent from them) with a language barrier she acted as translator, so thank you for that. Would have been 5 stars but a lot of the amenities were closed. The lady at the golf reception was so helpful as we had problems with Goldcar rentals and a broken car window (don't rent from them) with a language barrier she acted as translator, so thankyou for that. “My family and I have thoroughly enjoyed our stay at Desert Springs. The golf course was in fantastic condition and the Caddy Masters and Neil , the golf professional, all went ” the extra mile” to ensure everything ran smoothly. The two bedroom apartment had everything that we needed to be self sufficient if we wanted to be. When we chose to eat out the staff in both the Crocodile Club and the El Torrente Restaurant were courteous and helpful and the food was very good. 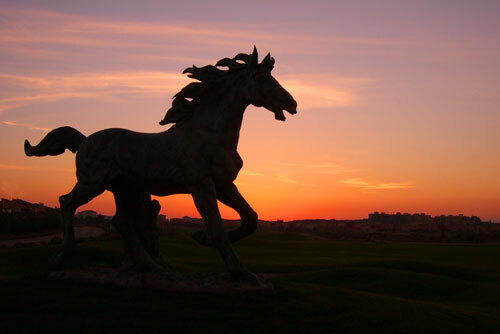 "My family and I have thoroughly enjoyed our stay at Desert Springs. The golf course was in fantastic condition and the Caddy Masters and Neil , the golf professional, all went " the extra mile" to ensure everything ran smoothly. The two bedroom apartment had everything that we needed to be self sufficient if we wanted to be. When we chose to eat out the staff in both the Crocodile Club and the El Torrente Restaurant were courteous and helpful and the food was very good. 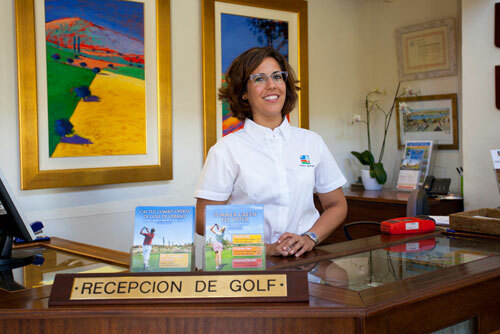 Alfonso Castineira Marcos, the Director of Golf, was always on hand to check that we were having a good time and we would definitely come back again. Great weather, great facilities and top class service! What more could you want?"